MSA Mortgage and Encore Realty sponsor the MSPCA (The Massachusetts Society for the Prevention of Cruelty to Animals) Cat Adoption Drive to be held on Saturday, August 25, 2018. The MSPCA is calling all Super Hero’s to adopt cats whose age, medical needs, or personalities have hampered their ability to find a loving home. MSA and Encore Realty sponsorship funds will allow the adoption fee of $150 to be waived the day of the drive. 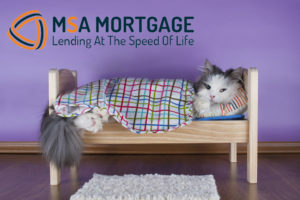 On Saturday, August 25th, MSA Mortgage and Encore Realty will sponsor each adoption so that every cat can have forever homes with caring people at no cost. Every cat has been spayed or neutered, up to date on all their shots and will receive a full medical exam before being placed with their adoptive parent(s). “We are thrilled to team up with Encore Realty to support this wonderful cause,” said Jason Deeb, Vice President/Senior Mortgage Planner at MSA Mortgage. The top donor will receive a discount of up to $10,000 (seller's side commission) on the sale of their property through Encore Realty's Principle Broker, Dave Monheit. The second highest donor will receive a $1,000 credit towards closing costs through MSA Mortgage. Dave Monheit, Partner at Encore Realty.